This baseball cap features custom, machine-embroidery of a Coyote's silhouette with "COYOTE" underneath. This is a 1 color stitching featuring a metallic silver thread. 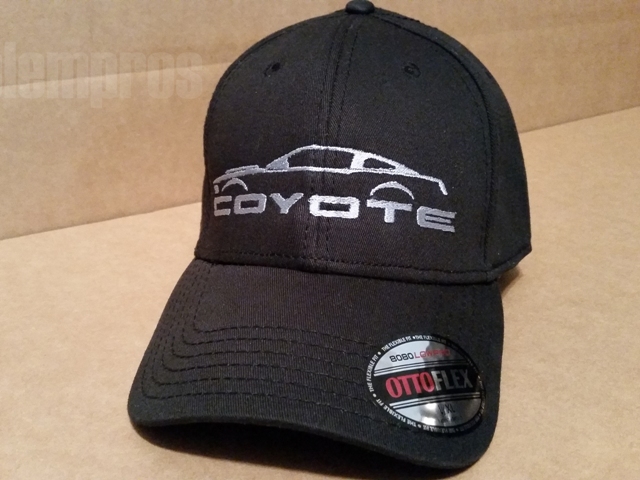 Make your hat match your Coyote at your next car show! These are high-quality, Otto Flex Stretchable Superior Cotton Twill, Low-Profile brand baseball caps. They feature a closed back, and inside elastic band. The size is L/XL and will fit most adults. Extra Notes: 96% Cotton 4% Spandex, Structured, Firm Front Panel, 6-panel Flexible Fitted, Seamed Front Panel with Full Buckram, 6 Embroidered Eyelets, Pro Stitch on Crown, 6 Rows Stitching on Visor, Matching Color Undervisor, Matching Color Sweatband.